The concept of EACY (Environmental Awareness for Children and Youth) has been rooted in Stairway’s soul ever since the inception of our programs nearly 30 years ago. Some of the very first activities at Stairway were summer camps with large gouprs of children from Manila, who were planting trees and learning about protection of our environment. With our partners from the Baguio Arts Guild, we were the first to mark and celebrate Earth Day, which became our official birthday as well. From the very beginning, we treated our work to protect children’s rights as inseparable from our obligation to protect our environment. Seen from an environmental perspective, things did not change for the better as we entered into the new millinium, and by 2010 we were sufficiently motivated to put more focus and energy into the environmental aspect of children’s rights. Our idea was not for us to fight for children’s rights to a safe environment, but to enlighten and empower children to be their own advocates. Thus, the idea of EACY as a program was born, and the hunt for financial backers began. One of the characteristics of Stairway’s development is that the right people always seem to show up, when they are needed the most, and Marshall Foundation was no exception to that rule. With solid support from Marshall, we launched EACY by mid 2013, and after a challenging start building the 50 foot floating classroom that became the Sea Adventure School (SAS), things have picked up and developed at great speed ever since. (see section about EACY in our annual report 2018). As we have become a respected and recognized partner in all local environmental concerns, and as the range and the scope of our EACY activities have grown, so has the need for additional financial support. 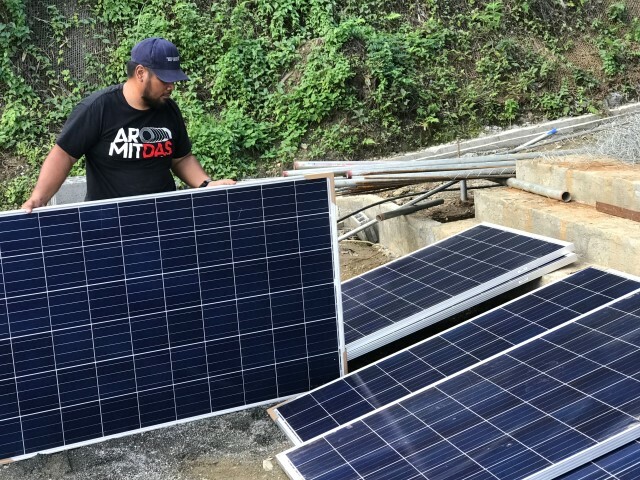 In 2018 EACY was supported by no less than 5 different groups of local and international friends, first of course Marshall, and joining in later were Grundfos IT Support Manila, SONION, Larsson Family (VEM), Scuba for Change, and last but certainly not least SolEnergy Systems Inc. With the help of SolEnergy and VEM, stairway is now nearly 100% powered by solar generated electricity! We greatly appreciate the help and support from all our partners to do all we can to secure a sustainable development in the best interest of our children.